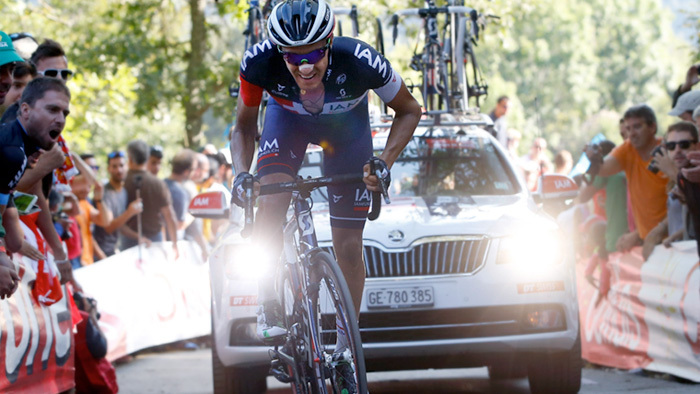 During stage 16 of the Vuelta a Espana, Team IAM Cycling’s Larry Warbasse bridged a gap to make it into the early breakaway. After making the small group of ten riders, Warbasse worked for over 5 hours to contribute to the group and climb the three categorized climbs to the finish. Here is a look at his power over the stage and what it took to take 8th on the day. View Warbasse’s full power file. Just 8km into the stage, Warbasse began his Peak 20 Minute Power of 401 watts, or 6.03w/kg in order to make it into the early breakaway. Working with the break, Warbasse had a Normalized Power® of 265 watts at 33.9km/h for nearly four hours before coming to the final major climbs of the day. During the ascents of the Category 2 Alto del Cordal and the Category 1 Alto de la Cobertoria he set his Peak One Hour Power of 305 watts, or 4.59w/kg while averaging 21.7km/h. After a small period of recovery while descending, Warbasse had to climb the HC Alto Ermita de Alba, which is 6.8km in length at 11.1% average gradient. Finishing strong, he set his Peak 30 Minute Power of 359 watts, or 5.40w/kg. Over the full 185km stage, Warbasse had a Normalized Power of 300 watts, averaged 86rpm at 30.4km/h, and burned 5447 calories on his way to finishing eighth on the stage.